« Ponoko – A Post-Industrial Revolution? Erick Schonfeld, editor-at-large of Business 2.0 magazine and presenter of The New Disruptors on CNNMoney , recently visited a startup called Desktop Factory. This company is involved in developing 3D printing hardware, and aims to bring their product within financial reach of home users within a few years. The most interesting aspect of Desktop Factory’s technology is that it uses a somewhat different approach to creating 3D objects to that employed by existing commercial 3D printing systems. Instead of selective laser sintering (SLS) or similar methods, Desktop Factory’s system uses $5 halogen bulb. A nylon based powder (the same type as is used in face makeup) is heated and etched, and each resulting layer is then stacked to form the three dimensional object. Desktop Factory is a product of Bill Gross’s Idealab. Gross has recruited a former Xerox executive, Cathy Lewis, to be CEO of the company, which plans to begin selling its 3D printers later this year for around US$5000. However, the company is confident that, as sales increase, the price can be reduced to under $1000 over the next few years, bringing it within range of consumer buyers. 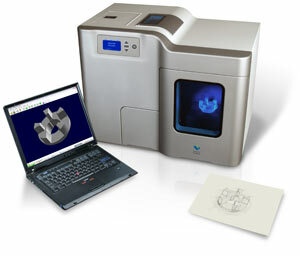 The Desktop Factory 3D printer is about the same size as early laser printers with the initial product measuring about 25 x 20 x 20 inches and weighing less than 90 lbs. This is certainly a different approach to 3D printing compared to existing commercial and non-commercial projects. No doubt there are many factors that will determine if this startup company and its technology becomes a success. It will certainly be worth following the progress of the company over the next couple of years. While the New Disruptors video is available at the link above, Erick Schonfeld has helpfully also included a transcript of it on The Next Net blog. This entry was posted on Wednesday, July 18th, 2007 at 9:30 pm	and is filed under Business, Business News, Digital Manufacturing, Technology. You can follow any responses to this entry through the RSS 2.0 feed. You can leave a response, or trackback from your own site. You can download all of these blogs to your own feedreader as an OPML file from Bloglines. The MadeForOne.com newsletter provides personalization news and information straight to your mailbox. Subscribe Now! Copyright ©2006 MadeForOne.com. All rights reserved.